"the angle of the dangle is inversely proportional to the mass of the ...something"
" sideways scratches on your tungsten will cause dogs and cats to sleep together." " sideways scratches on your tungsten will also cause pandemonium and the end of the world as we know it." so pay attention to the way you grind your tungsten. You have probably read that Tungsten electrodes should only be ground longitudinally, not sideways or the world will come to an end and dogs and cats will start sleeping together. Take it from someone who has been TIG welding for over 30 years and has sharpened electrodes every way imaginable including using a cutting torch. That’s right I said cutting torch. It does matter how you grind tungsten electrodes. There is a big difference between a tungsten electrode ground sideways on a 36 grit stone to one ground properly on a fine diamond wheel. But there is not much difference between a tungsten ground sideways on a fine wheel and one that has been ground longitudinally on the same wheel… Unless you are welding razor blades or at extremely low amperages. or doing automatic low amperage orbital welding. A lot of people will argue this point with me. I dont care. I cant make myself say that tungsten grinders make a lot of difference when I dont really believe it. Its splitting hairs over something that makes so little difference. 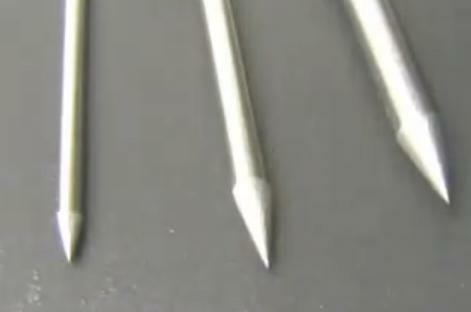 If I am welding really thin stuff, I like sharp electrodes. Really sharp ones. I want them to draw blood easily. But if you want penetration on the thicker steel , it’s good to have a little less taper with a little flat spot ground on the tip. Torch angle effects penetration. The more vertical the torch is, the more arc is directed into the part. Think about it like this…when you angle the torch too much its like trying to penetrate thru thicker metal. 90 degrees is the shortest distance to the other side of whatever you are welding. Put a vent hole in anything you weld that will be sealed up completely or air will heat up and expand and blow away your shielding gas or even blow out at the end of the weld bead. Some machined joints that are sealed on one end will not even allow you to start welding because the fit is so good that the part is air tight before you even weld. Other machined parts where a part is pressed in and bottomed out can give cracking problems because there is no where for the part to shrink. 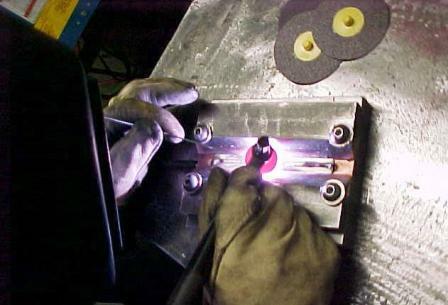 If you have to weld something that has been pressed in and bottomed out, make sure to add more filler metal than average to tacks and the final weld bead. That is to prevent the cracking that happens when you run a concave bead and the metal has nowhere to shrink. Hastelloy W TIG welding rod has become extremely expensive. 312 stainless is also a very good rod choice for welding steel of unknown composition. For a critical weld, you should not just rely on 312 without knowing the metal type..you should determine the metal type for any critical weld. Write down what works and doesn’t work. Write down that perfect amperage that works every time for a certain job. Get a 100 dollar digital camera or use your phone camera and keep a record of complicated fixtures or certain sequence of welds that works. Keep a record of what filler rod was used on what and how it worked. It doesn’t have to be neat , just keep a notepad and pen handy in your toolbox. Extend the tungsten out of cup 1/4” to 5/16” when welding high amperage aluminum or heat will radiate from the cup to tungsten and reduce output, especially if the orifice is too small. Have you ever seen small diameter TIG cups glow red from extended welding at high amperage?...me too. ...and there is always an exception to every rule. 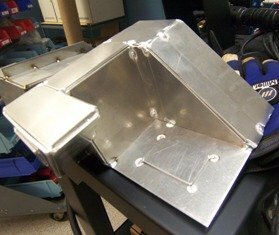 some welders dont extend the electrode at all when welding aluminum castings to avoid the possibility of tungsten inclusions.